Even in the digital age I seem to have the ability to occupy all of the space available. Recently, I upgraded the hard drive in my laptop computer. This left me with a perfectly functional internal drive outside of my computer. Macally to the rescue. 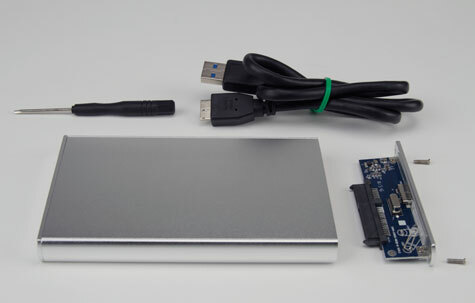 Their Aluminum USB Hard Drive Enclosure is just the ticket to turn the delicate, surplus hard drive into rugged, ready storage for the road warrior. The package came with everything I needed to turn my hard drive into robust clone, TimeMachine drive, or extra storage device. The parcel contained enclosure itself, a cable to connect the drive to your computer’s USB 3 or USB 2 port, and even a screwdriver that is the only tool required to install the drive. The printed assembly instructions contained several small photos and very limited text. But this was all that was required to convey the straightforward installation process. Anyone who has replaced a hard drive in a computer would be able to accomplish this task without the aid of the instructions. Not much need be said about how this system works because it operates the way one would expect. Plug it in and the drive appears on your desktop. I was able to read, write, and boot from the drive just as if it were installed inside the laptop. The USB 3.0 connection has plenty of speed for auxiliary data storage or an alternate boot drive when required. At first, I thought that slipcase or a drawstring pouch would be a nice addition to the package. Upon further reflection, this durable silver colored enclosure will be easier to find in the dark recesses of my computer bag without a travel pouch. 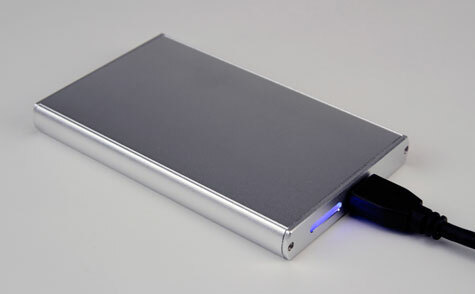 The aluminum case is approximately 3.0 X 5.0 X 0.5 inches. This very sturdy case will protect the valuable data inside from the bumps and scrapes of road warrior use and dissipate the heat of prolonged data access. This enclosure is bus powered and as such does not require a separate power port. MyMac Podcast 610: So how did we do?